that Fascism is nothing but monopoly-capitalism imposing its will on those masses on those masses whom it has deliberately transformed into its slaves. It is fundamental to its understanding that all the organs of working-class defence are destroyed; it is fundamental to its understanding, also, that society has been merged into a state the outstanding characteristics of which is the imposition of its will by coercion. There is no social revolution: the ownership of the means of production remain in private hands. There has been a political revolution in the sense that those organs through which, prior to 1933, criticism of the social order might be expressed, have been ruthlessly destroyed. What replaces them is essentially a partnership between monopoly-capitalism and the Nazi Party in which that supreme coercive power which is of the state’s essence is used to compel obedience to the new system. This view of the Nazi state has been rejected by historians, as big business largely only started funding the Nazi party quite late, and always maintained some degree of freedom after they were absorbed into the Nazi system of controls. 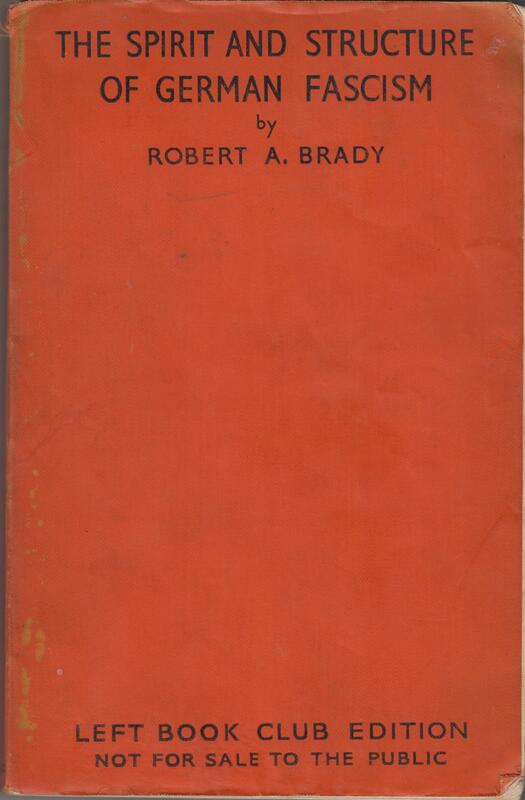 Despite this, Brady presents an impressive argument on how far the development of monopoly-capitalism – the emergence of vast industrial cartels and industries dominated by only single or at most, two companies paralleled and prepared for the emergence of the Nazi state. Brady was also alarmed at the prospect of Fascism taking power in other nations, including America. The very last chapter, ‘The Looming Shadow of Fascism’, contained a number of quotations, some from American Fascist ideologues, arguing for certain aspects of Fascism. It includes this quote on using unemployment to control the masses by an economist. As Guy Debord’s Cat has demonstrated on his blog, this is exactly the argument advanced by von Hayek and the Chicago School. They wanted a constant unemployment rate of 6 per cent to keep wages down. Von Hayek was Thatcher’s favourite economist, while Milton Friedman, another member of the school, went down to Pinochet’s Chile to observer for himself how well that Fascist caudillo was putting his theories into practice. And it’s a policy that’s being pursued even today by Thatcher’s successors, Cameron, Clegg and Osborne. Tory MP Nadine Dorries is in this fortnight’s Private Eye . The MP, who famously described Cameron and Clegg as ‘two posh boys’ and went on to describe categorically how out of touch they were, is this time in it for showing off her grasp of advanced statistics on The Daily Politics. She was claiming that the Tories were doing ‘fantastically well’ at managing and improving British schools. When the interviewer, Jo Coburn, mentioned that 23 per cent, nearly one in four of British schools, were below Ofsted standards. To which Dorries replied that five years ago the figure was much worse. She thought it was one in seven. No wonder standards are falling. And to think these morons are in charge of our education system. I live in Sweden and am a Dutch citizen. It was a pleasure to read about the first Swedish Pegida demonstration, in Malmö last week. Eight Pegidistas versus more than one thousand anti. Contrast that with the current rise of neo-fascism in the Netherlands. Here is the best short article on that reactionary trend that I have seen. It should dispel a few myths. It’s great to see that Sweden is still living up to its reputation as a place for sanity and tolerance, despite the attempts of Pegida to wreck it. What is much more surprising to many foreigners is the rise of a large, anti-Islamic extreme Right in the Netherlands. The Netherlands after all has a reputation for being one of the most tolerant societies in Europe. In the 17th century it was one of the very few countries that did not have an established church. This was not because the Dutch were any less religious than the surrounding nations. Indeed, Alexander Graham-Dixon in one of his programmes on the Art of the Baroque, when covering the Dutch art of the period gave a contemporary saying as an example of the deeply religious divisions in the Netherlands in that period. The saying said that if there were three Dutchmen, two of them would immediately form their own churches, and accuse the third of being a heretic. They did not set up an official, established church, because they did not feel that force should be use to enforce religious belief. If a particular religious denomination or sect was to survive, it should do so through peacefully winning over and retaining believers. Moreover, the Netherlands itself suffered brutally from the Nazi occupation. During the War, the Nazis attempted to break the Dutch people through withholding food supplies to create a terrible famine. When I was at school in the 1980s our school had an exchange scheme with another school in the Netherlands. Despite the intervening decades, memories of the Nazi atrocities were still strong with some of the older generation, and there were people, who bitterly hated the Germans. With this history of persecution by Fascism, it’s amazing how anything like an organised Fascist movement could ever be popular in the Netherlands. In the Netherlands, the right-wing PVV (Freedom Party) has steadily garnered power using a hate-filled discourse directed at Muslims and elites alike. The Dutch far-right has evolved into one of the most successful national movements in Europe. Its leader Geert Wilders is a major political figure with international support. In many ways Wilders is the heir of Pim Fortuyn, a politician who played a crucial role in shaping a new right-wing current, ‘national-populism’, in Dutch politics, and who was murdered in 2002. Populism here means the idea that society is separated in two camps; the ‘good people’ versus a ‘corrupt elite’. The ‘people’ are not the whole of society, but the part of the society that is considered pure and whose political will is considered legitimate: it is a partial object that stands in for the whole. Who is part of the ‘people’ is not given, the borders of this category are contested. The selection of those considered part of it and who are not is a political act. Different kinds of populism use different criteria to select and shape ‘the people’ into political actors. In national-populism, the ‘people’ and the nation tend to overlap: the nation is not equal to the citizenry but to the ‘people’, a term with an historical, ethnic connotation. The national-populism of Fortuyn and Wilders calls for the disappearance of an ‘alien’ minority culture to preserve a mythical, homogeneous ‘Dutchness’. The article traces the rise of extreme-rightwing, ‘gay-friendly’, anti-Islamic populist movements from Frits Bolkestein of the right-wing Liberal party, the VVD, through Pim Fortuyn and to the Partij Voor Vrijheid (Party For Freedom) of the notorious Islamophobe, Geert Wilders and Ayaan Hirsi Ali. Bolkestein set the pattern for the development of Islamophobic right in the Netherlands in a speech he made in 1991. In a speech to the Liberal International, Bolkestein contrasted European and Christian civilisation with that of the Islamic world, arguing that democracy and human rights were a product of a single, European culture, rather than emerging from a clash within different cultures. This was taken up by Pim Fortuyn. A right-wing cultural pessimist lamenting the decline of community cohesion, traditional values and patriarchal authority figures, Fortuyn combined nationalism with neo-Liberal programme of severe cuts to the welfare services. In his 1997 book, Tegen de Islamisering van Onze Cultuur, ‘Against the Islamisation of the Our Culture’, Fortuyn presented Dutch culture as under threat from a homogenous, a-historical Islam. In his view, Islam was not just a religion, but also a worldview and political system. By constructing his attack on Islam as one of culture, not race, he avoided being linked to the racist, neo-Nazi far right. Nevertheless, the article makes clear that Fortuyn also made deeply racist comments, such as his statement to the Dutch paper De Volkskraant that Moroccans never stole from each other. Fortuyn’s party, the List Pim Fortuyn, disintegrated amidst internal feuding after his assassination in 2002 by the environmental activist Volkert van de Graaf. 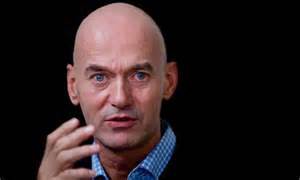 Fortuyn’s anti-Islam stance was then taken up by Geert Wilders, then a member of the right-liberal VVD. Along with Ayaan Hirsi Ali, Wilders promoted the idea that the conduct of Muslim immigrants in the Netherlands were determined by their religion, and that it was the cause of the sexism and racism in Dutch Muslim culture. The religion was also the root cause of socio-economic poverty and dictatorships and absolute monarchies in the Islamic world. Wilders left the VVD to form his own party in 2004. The new party received a massive boost with the murder of the bitterly anti-Islamic Theo van Gogh. In the aftermath, dozens of mosques and hundreds of Muslim immigrants were attacked. In 2010 Wilder’s party attempted to capitalise on fears generated by the recession by throwing out their previous, Neo-Liberal policies. The party had previously stood for a flat tax rate, attacks on trade unions, abolition of the minimum wage and making it easier for firms to dismiss workers. Wilders’ party then pledged to defend the welfare state and workers’ rights, while claiming that they were under attack through immigration. The party then attempted to prevent these same civil rights from being applied to immigrants through linking social security to length of citizenship, language skills, and the adoption of secular dress. Those wearing burqas or niqabs were to be ineligible for benefits. Wilders’ party entered government as the coalition partner of Mark Rutte’s VVD government. In doing so it gave up many of its left-wing demands and committed itself to Rutte’s austerity programme. The Coalition collapsed in 2012 when the PVV withdrew from negotiations about the implementation of further austerity. The following year Wilders’ began to establish links with other, European Far Right parties, like the French Front National, the Vlaams Belang in Belgium, and the Freiheitliche Partei Osterreichs in Austria. Wilders also went on tour of Holland collecting anti-austerity signatures, and set up a website offering legal advice for blocking the construction of mosques. The article points out that Wilders’ success is remarkable, considering that his party doesn’t have members or much of an organisation beyond a website. This has given him absolute freedom to choose which candidate to support. It also points out that the success of Fortuyn and Wilders is partly due to appearances on TV and the net. Fortuyn in particular benefited from the support of the mainstream Conservative media. Wilders so far has eschewed appearing on TV and being interviewed by the papers because he distrusts their supposed ‘left-wing’ bias. The Dutch anti-Islamic far right has also benefited from selectively including parts of the radicalism of 1968. They have taken on board verbal support for feminism, gay liberation and opposition to anti-Semitism, while rejecting the Green movement and anti-racism. Women’s and gay rights, and acceptance of Jews, are seen as intrinsically Dutch characteristics and their origins in the left-wing and progressive movements is ignored. The article also considers that Bolkestein, Fortuyn and Wilders have also gained through the Netherlands’ self-image as an open and tolerant society, and the taboo on looking too closely at the endemic racism within it. This is particularly acute because the Dutch Left has largely abandoned anti-racism, and even taken over some aspects of the nationalistic Islamophobia of Wilders et al. It’s a fascinating, provocative article that needs to be read, not just for the light it shines on this ominous aspect of Dutch politics, but also on the links and similarities to the growth in other anti-Islam groups and organisations throughout Europe, such as Pegida in Germany, and the EDL over here. Despite the PVV’s massive growth, I’ve met many Dutch people, who were bitterly and outspokenly against Wilders and his bigotry. One young woman I knew at Uni said that she intended to leave the Netherlands if he won an election. I hope she didn’t, as no-one should feel forced out of their homeland by bigots. 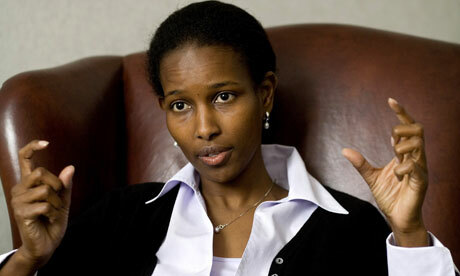 Ayaan Hirsi Ali considering the size of her next speaking fee. As for Ayaan Hirsi Ali, she is a highly controversial figure. Her family have denied that any of the maltreatment she describes as being inflicted on her by her family has ever actually occurred. A non-Muslim friend of mine, who has taught university classes in Islam, is spectacularly unimpressed with her. He sees her less as a principled politician, than as a venal opportunist, who has exploited her supposed escape from Islamic oppression to gain money, influence and political power. She’s made money very cynically from telling the Islamophobic Right exactly what they want to hear. All the while using and discarding former allies than when they are of no use to her. What has come across from this article is the similarity of approach of the anti-Islam activists across the West, from America to this side of the Atlantic. There is the same denial of racism. They don’t object to Muslims because of their ethnic origin, but because of the social, economic and political aspects of their religion. There is the same view that Islam is uniformly anti-feminist and bitterly hostile to gays. The anti-Islam sites over here and in America carried stories about Muslims beating up gays in Amsterdam, for example. There is also the same claim that, in order to protect the welfare state, measures must be put in place to limit immigration. In the interview I put up this morning between Nigel Farage, the Fuhrer of UKIP, and Evan Davies, Farage stated that in a decade or so’s time, we may have to introduce an insurance system to fund the NHS due to the expansion of the country’s population to 80, 90. or 100 million. Farage was very careful not to single out any particular religion or ethnic group, but his party does contain any number of swivel-eyed loons with a venomous hatred of Muslims and non-Whites. The message, and that of the anti-immigrant Conservatives, is the same: the welfare state is under threat from immigrants, who are placing far too much strain on the available services. This conveniently ignores the fact that the welfare state has been decimated by decades of Conservative rule, and is likely to be destroyed completely if Cameron’s horde of robber barons are returned to power. And Wilders has more than his fair share of supporters in this country. 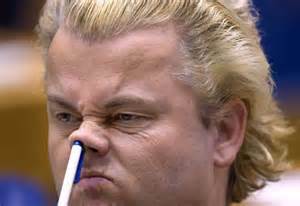 About ten years ago there was controversy in Britain, when Wilders was invited to speak at the House of Lords. He, and groups like him, aren’t a problem confined to the Netherlands. They’re all over Europe, and threaten all of our societies. This is a continuation of the comments I posted on my reblog of Tom Pride’s interview with Jolyon Rubinstein. Rubinstein is on a campaign to get the politicos to take the young seriously. He laments that while there are certain politicians across the House in all parties, who want to get more young people interested in politics, the majority don’t. In his interview with Mr Pride, he seems to feel that the established position among the parties is that they don’t trust the young, as engaging them would upset the ‘status quo’. I think he has point. When politicians have tried to engage the young, it’s been patronising and rather half-hearted. The prime examples of this was when various Tory MPs suddenly started telling the world, who their favourite pop musicians were. Almost as if there’d been a meeting at Central Office, which said, ‘Okay, chaps, next on the agenda: young people. They like pop music, so you’ve all got to have a favourite band or pop star. The PR people have had a look at what’s in the charts, and compiled a list of who you’re going to like.’ It was hardly surprising that the bands selected include the Spice Girls and the Scissor Sisters. They were in the charts and were highly popular. The Scissor Sisters seem to have been deliberately chosen to show that the Tories were now at ease with gays. Of course the bands they chose weren’t anything too challenging or potentially controversial, like Public Enemy, NWA, Megadeath, or the Mission. They were either too obscure, or would have put too many potential voters off, in the case of Public Enemy and NWA, with their angry, racially alienated stance. And the bands definitely did not include PIL. The other way the parties have tried to appeal to the young is by having progressively younger Prime Ministers and members of their cabinet. I’ve got a feeling that when he was elected, Blair may have been Britain’s youngest prime minister. Cameron, Osborne and Clegg are also young. Well, young-ish. They’re still in the ’40s. As they should be. I want senior politicians old enough to have a proper, lived experience of the world and its trials and problems. Age shouldn’t necessary be a barrier. It shouldn’t matter how old the MP is, provided that they actually have some understanding of what life really is like for most young people. Simply saying that they are concerned with young people’s problems, because they’re parents, or from talking to parents and young people themselves, simply and unostentatiously, and actually showing they have, would overcome a lot of this alienation. But they don’t. They simply dole out to the under 30s the same patronising flannel they give to the rest of the population. They might state that they understand their problems, but the very next thing they say in their next breath shows that they don’t. They then go back to talking in the abstract about economic predictions, without actually seeming to take on board that this has real consequences for their audience. They seem just interested in the abstract, economic reality without taking on board that to their audience, this means whether they can afford a proper house, decent clothes for the kids, run a car. Or for the unemployed and disabled, getting enough to eat that month. And I think Rubinstein is right about the parties distrusting the young. Young people have dangerous ideas. They can be dangerously and embarrassingly radical. Bliar deliberately closed down democracy in the NUS, probably because too many of the delegates were too extreme. And the Tories had troubles with their youth wing becoming increasingly racialised and supporting apartheid and racial nationalism. Possibly going further, they may well be afraid of the spirit of ’68 and the radicalism of the 70s. The ’60s were a revolutionary decade, where youthful rebellion merged with and supported a number of then-radical, liberal causes: feminism, Civil Rights and ant-racism, militant peace movements against imperialism and particularly the Vietnam War. The election of Thatcher and Reagan was partly a reaction against all that, and succeeding administrations have tried to stress how responsible and sober they are, rather than youthful radicalism and revolt. Even as these administrations have taken over some of the liberal causes, like equality for women and ethnic minorities. You can see how much the Conservatives in particular hated youth culture, its fashions and political radicalism, by the cover of one of the books written by one of the Tory journos attacking Blair. Blair at the time was busy reforming the House of Lords, or stuffing it with his own supporters, whichever way you want to look at it. He was also engaged on other constitutional reforms, like suggesting possibly that judges might after all look a bit better if they didn’t have the horsehair wigs stuck on their heads. This was too much for that particular defender of the British Constitution. The cover showed Blair as some kind of punk or rocker, in black leather jacket and combat trousers. The terrible, slovenly, ignorant sprogs of the great unwashed were out there, and about to tear down tradition and decency. Kenny Everett’s thick punk character, Sid Snot, had risen up and somehow got into No. 10. If Middle England didn’t act pronto, he’d be followed by Harry Enfield’s Kevin and Perry. Quick! Give them proper haircuts and make them do National Service! All of this has created a political culture in which young people are marginalised and distrusted, no matter how youthful country’s leaders are. Politicos don’t have to adopt their dress or youth culture to engage with them. My guess is that when it comes to conducting business, most people would prefer to see their politicians and public officials dressed conservatively in jacket and trousers. That said, I used to work in the Benefits Agency just before they passed the law requiring everyone to where suitable business clothing to work. You did see some of the younger staff wearing jeans and T-shirts for rock and pop bands. My guess is that while some of the older clients may have found it objectionable, most of the people actually going in probably couldn’t care less what the civil servant opposite them was wearing, so long as they were able to get them some money and properly process their claims. Another contributory factor in the alienation of young people from politics is undoubtedly the fact that the parties have concentrated on getting funding and support from rich, frequently corporate donors, rather than party subscriptions. The result has been that party membership generally has plummeted. The local Conservative Associations in particular have stated that they feel they are ignored and sidelined by the Tory party machine. Rubinstein has identified part of it in his recognition that people feel that the only thing that’s important to politicians is money, not people. Politicians desperately need to reconnect with the young, along with much of the rest of the population. Indeed, just about everyone, who didn’t got to public school and has an income less that £50k. But as the Tories are doing their level best to stop people from registering to vote, and even taking the franchise away from resident Irish people and Commonwealth citizens, I can’t see Cameron taking any initiative in this direction at all. I’ve just reblogged Guy Debord’s Cat’s piece attacking Daniel Hannan’s remarks on Russell Brand. Hannan is an extreme Right-wing Tory MEP for Dorset, who wants Britain to leave the EU and privatise the NHS. 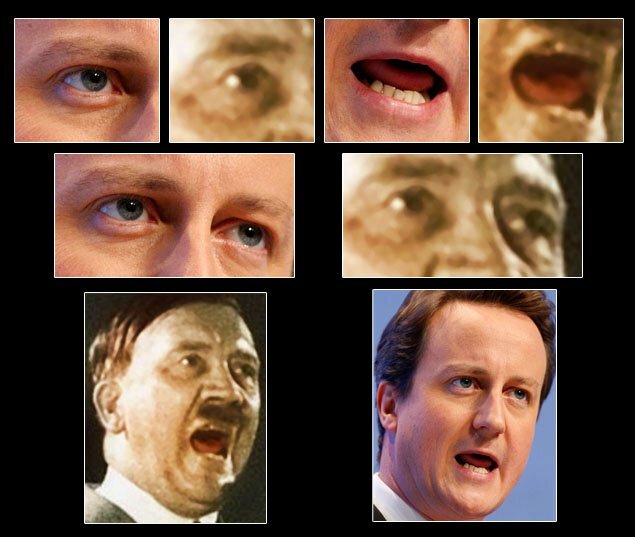 He’s basically a Kipper, who hasn’t joined the exodus from the Tories and sworn eternal fealty to Fuhrer Farage. Brand has established himself as something of a radical ideologue with his book Revolution. It’s been attacked for being woolly, with a naively positive attitude towards religion and spirituality. Nick Robinson in particular attacked it in the pages of the Radio Times for encouraging people not to vote. This would be extremely bad for the country, as it would leave politics to be dominated by small, extremist parties. As opposed to the big extremist party now calling itself the ‘conservatives’, of whose youth wing Robinson was the leader when he was a student in Macclesfield, I suppose. As the Cat’s piece makes clear, what has really upset Hannan and the other critics is Brand’s attack on politics as the preserve of the rich middle class. Hannan’s ideal, which is also shared by the Kippers, Clegg’s Lib Dems and elements of New Labour, is that politics should be dominated by the right kind of people: middle class and privately educated. They are to be not only the political decision-makers themselves, but also the journalists, media commentators and opinion-formers, who interview, critique and interpret them and their actions for the proles further down the social hierarchy. This anti-democratic mentality is most explicit in the Kippers, one of whose members, for West Hampstead, has gone on record as saying that he sometimes feels the 19th century Reform Acts of 1832 and 1888 that extended the franchise to the middle classes were a mistake. This particular Faragist believes that it should be stripped from certain classes of people, like criminals. This is quite apart from the party’s extremely misogynist attitude, which would see women disenfranchised socially and economically if they came to power. Some idea of how powerful, and how much of a threat someone feels Brand’s ideas are was shown on Charley Brooker’s Weekly Wipe Thursday night. This featured a strikingly good satirical impersonation of Brand by a female comedian, suitably made up to look like him. The make-up and prosthetics were extremely good, and the impersonator did capture more than a little of Brand’s androgynous mannerisms and whimsical, sharp, turns of phrase. Brooker himself is certainly not averse to pouring his blistering scorn on the leaders of all the parties, and he made some suitably scabrous – and highly sexual comments – about Cameron, as well as other remarks on the poor performance and dismal character of Ed Miliband and Clegg. Brand is, of course, certainly not beyond satire. His position as a tribune of the lower orders is somewhat contradictory, considering that he is a highly educated member of the middle classes, from a very good middle class home himself. But the fact that Brooker felt he needed to be included in the programme and sent up shows the extent of Brand’s influence with Brooker’s target demographic. It also suggests that Brand, and his vlogs on Youtube, might just also be viewed by someone in the Beeb’s commentariat as something of a threat to their own hegemony on political comment and discussion. And from their point of view, as members of the same class as the politicians they scrutinise and interview, this would be a very, very bad thing indeed. Ed Miliband has warned the tax havens costing British families and businesses billions of pounds that they will have just six months to put their house in order and open their books – or face being placed on an international blacklist. 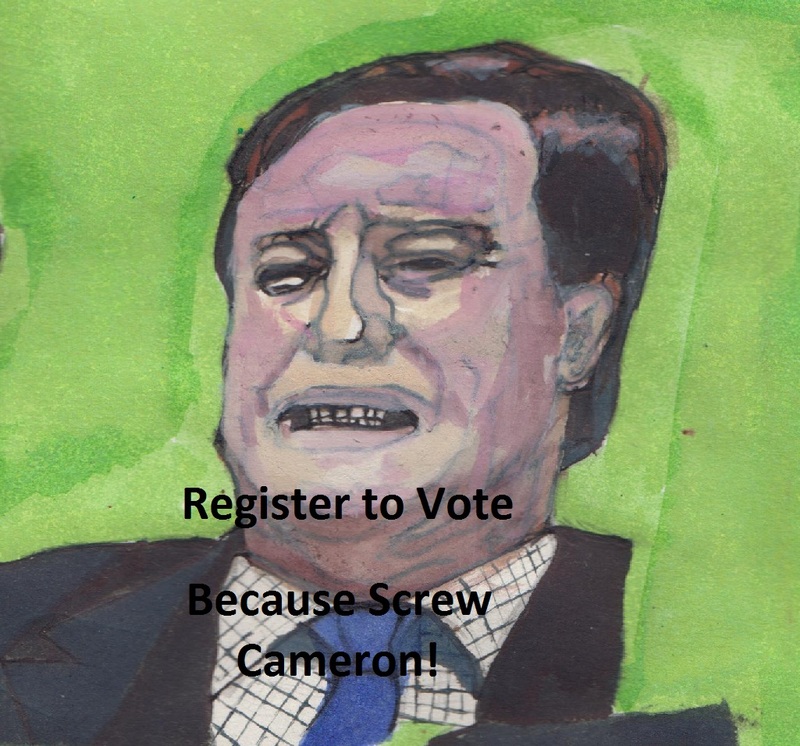 He has highlighted figures showing that, despite David Cameron boasting more than 18 months ago that he had forced tax havens to open up, not one of the tax havens linked to Britain as Overseas Territories or Crown Dependencies has yet delivered on Cameron’s promise that they would publish a register showing who owns the companies registered there – and some have explicitly refused to do so. The lack of leadership shown by the UK government has frustrated and slowed the pace of reform on tax avoidance across the world. In a letter to heads of government, Mr Miliband served notice on them that that under the next Labour government they will have six months to publish publicly-accessible central registers of beneficial ownership. If they fail to meet this deadline, the next Labour government will withdraw the protection they get from international scrutiny and ask the Organisation for Economic Co-operation and Development to place them on its tax haven blacklist. “Today, we have a government planning real cuts in spending on schools but one that only postures—and does not act over the scandal of tax avoidance. “Let me say to the Prime Minister: It is not pro-business to defend tax avoidance. “Britain is losing billions of pounds in lost revenue that could be invested in our future. It is costing everyone who pays their fair share of taxes, including millions of British businesses. He said: “The current Conservative leadership have become the political wing of offshore hedge funds. Much of the system of tax avoidance was put in place by Blair and Brown. It’s good that Miliband has re-thought this policy, and is now trying to end at least some of its excesses. It contrasts strongly with that of the Tories, who believe, like that the ancient aristocracy, that as aristos they shouldn’t have to pay tax.